Tablein is a table booking software created specifically for small restaurants, providing them with modern capabilities to help them attract diners and book more reservations online as compared to traditional booking processes such as phone calls and actual logbooks. The system is built to help small restaurants enhance their booking workflows, saving them a lot of time and resources while decreasing instances of no-shows. 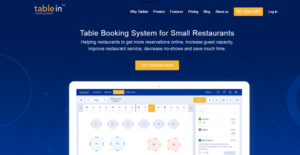 With its friendly user interface, a plethora of tools, and affordable pricing, Tablein has become the booking reservation platform for choice for many small restaurants. Users of the software have reported a gradual and dramatic increase of reservations while the ease of use allow their staff to get familiar with the system with little training. Tablein is noted for its exceptional ease of use, even for novices who have never used or encountered a table booking management software before. The interface is so intuitive that it takes 10 minutes or less for staff to get fully familiar with the software’s features and functions. This means you can set up and implement Tablein right off the bat with little training, resulting in the faster implementation of the software and quicker ROI for your business. Gone are the days where diners have to phone in to reserve a table and restaurant staff have to consult their calendars and logbooks to confirm availability. The old method was time-consuming and in many cases, confusing. With Tablein, customers can go to your restaurant’s website and click on the Tablein widget to book their reservations. They have the option to reserve a table on a specific date and a specific time. This helps eliminate confusion as well as decrease instances of no-shows. The widget also functions as a feedback tool, gathering comments from diners that provide you with insights on how to further improve your service and attract more customers. Tablein provides you with a support team that responds in real-time via chat. Whenever you have issues with your software, you can count on Tablein support to help you address and resolve system issues quickly so that it won’t hamper your operations. What Problems Will Tablein Solve? Consider a practice with an average 10 missed no-shows a day, if the average value of each missed table would be 20 – 50 euros, it costs 4800-12000 a month in lost revenue. Customers, who make reservations and never show up, are scathe for every restaurant. To avoid no-shows, the program sends automatic reminders to customers phone or email of their upcoming reservation and ability to cancel reservations if they have other plans. Most of the clients want to come at 19.00, so a small restaurant mostly had 1 or maximum 1.5 turns per evening. Very ineffective for restaurant size and pricing level. Another problem in restaurants – gaps between reservation times. If you could not accept bookings for just 30 min or 1 hour, tables were standing empty. The small kitchen had a huge load when mostly all came at 7 and order began to flow. It is not easy on paper to manage times, change and adopt them. Using so-called time templates, the restaurant can schedule reservation times to get 2 and 2.5 turns per evening and also avoid kitchen overload. When you have only phone bookings, very few clients left their emails and ask to be informed for news. Facebook also is not a solution as posts are not seen by all likes. With Tablein.com restaurant can grow clients mail list and send special offers by newsletters. Client database with visit history, cancellation number, no show number, name helps to recognize most loyal clients. So you can provide some present for those, who visit you more than 20 times. Clients don’t need to have one more loyalty card in their wallets. If you are considering Tablein it may also be sensible to examine other subcategories of Best Restaurant Management Software collected in our database of B2B software reviews. Every enterprise has different needs and needs an application that can be personalized for their size, kind of employees and buyers, and the specific industry they are in. For these reasons, no software can proffer perfect tools off-the-shelf. When you try to find a software app, first be sure what you need it for. Read some Tablein reviews and ask yourself do you want basic features or do you require complex features? Are there any industry-specific tools that you are looking for? Obtain the answers to these queries to help your search. There are lots of aspects that you need to mull over and these include your budget, particular business needs, your organization size, integration needs etc. Take your time, use a few free trials, and finally choose the app that offers all that you require to enhance your company competence and productivity. How Much Does Tablein Cost? Tablein offers the following basic and enterprise pricing options for users to choose from. Give the details a look, and select the best plan for your business. We realize that when you make a decision to buy Restaurant Management Software it’s important not only to see how experts evaluate it in their reviews, but also to find out if the real people and companies that buy it are actually satisfied with the product. That’s why we’ve created our behavior-based Customer Satisfaction Algorithm™ that gathers customer reviews, comments and Tablein reviews across a wide range of social media sites. The data is then presented in an easy to digest form showing how many people had positive and negative experience with Tablein. With that information at hand you should be equipped to make an informed buying decision that you won’t regret. What are Tablein pricing details? What integrations are available for Tablein? Pros: Clients can make reservations online at any time, even then the restaurant is closed, also they get automatic reminders. Cons: There is not much negatives of this software, except tables plan of big restaurant hole could be shown more comfortably on tablets or telephones. Pros: Clients can make the reservations on their own, easy to manage the program. Cons: Could be shown limited reservation times "from" and "till"
Clients can make reservations online at any time, even then the restaurant is closed, also they get automatic reminders. Clients can make the reservations on their own, easy to manage the program. If you need more information about Tablein or you simply have a question let us know what you need and we’ll forward your request directly to the vendor.